Lizze has a wonderful life for a 13 year old girl. Since her parents’ divorce she doesn’t see her father – he moved to California – but living next door to her best friend Evie Verver makes Lizzie feel as if her family is complete. Evie’s feminine yet strong older sister Dusty is more central to Lizzie’s life than is her own brother, and Mr. Verver is a father-figure extraordinaire, plus perhaps a bit of a crush of Lizzie’s. When Evie disappears suddenly after school, though, Lizzie’s entire world turns upside down. As the person who spent the most time with Evie, Lizzie is convinced that she must know something that nobody else knows, something that can save Evie. Without her friend, Lizzie feels empty, and she cannot bear Mr. Verver’s pain, or the speculations of the girls in school as to what has become of Evie. The more she digs into her friend’s disappearance, though, the less convinced Lizze becomes that she really knew Evie at all. Missing girl novels are not exactly few and far between, and they have been attempted by some fabulous authors – Stewart O’Nan’s Songs for the Missing and Hannah Pittard’s The Fates Will Find Their Way come to mind – but The End of Everything proves to be a very strong entry in the field. Looking at the entire incident from the point of view of a young girl brings an entirely different perspective. So many of these books are told at least partly through an adult’s eyes (or the eyes of multiple adults), but Lizzie brings an innocence and an urgency to the situation. So often the adult characters move very quickly to despair, or a hope that somehow seems bereft, but Lizzie continues to believe not only that Evie can be saved, but that she is the one who must somehow hold the key. Despite the fact that so much of the book is very internal with few actual plot points, Lizzie’s perspective on the situation makes for a compelling read. Emily Bauer and Kate Simses are absolutely my favorite female narrators of young adult books. Like Simses, Bauer is both compelling and believable as a teen or young adult. While she doesn’t quite sound 13, she definitely has a young enough voice to allow the listener to suspend disbelief and accept her as a young teen without being pulled out of the story by an overly mature voice. She does a wonderful job narrating the oft-disturbing The End of Everything, thoroughly convincing me that the problems I had when listening to one of her prior audiobooks had much more to do with the story and the way the character was presented by the author than the way Bauer voiced her. This is definitely a strong audio. Abbott has created an extremely strong story of loss and fear, which is only enhanced by Bauer’s compelling narration. This is a great listen, but would likely be just as fabulous in print, pick it up either way. 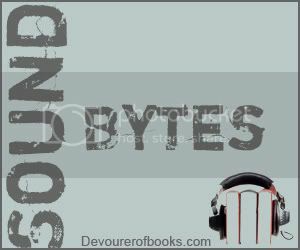 I encourage you to review any audiobooks on Fridays and include the link here. If you have reviewed an audiobook earlier in the week, please feel free to link that review as well. Thanks to Pam for creating the button. I tend to be a fan of darker books. So your “oft-disturbing” description caught my eye. Sounds like an interesting read. I’ll add it to the list! I loved the book so I’m glad to see the audio was well done. Sounds like an interesting book! Just wanted to let you know that I nominated you for one of those versatile blogger awards. Do with it as you see fit. This sounds like something I would like. I’ll have to check it out. Sounds interesting – the story told completely from the young character’s point of view is a nice change from the average missing child story. Sounds intriguing, and I like Kate Simses as a narrator so would be inclined to try the audio. The missing child subject is hard for me to read, though it’s interesting that it’s told from another child’s perspective. I bought this one so long ago that I completely forgot what it was about. Looks like I need to move it to the top of my pile. 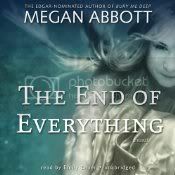 The End of Everything [Audiobook Review] | my books. my life.